James Hargest College is a large co-educational school of approx. 2,000 students, in Invercargill, New Zealand. The school caters for students from year 7–13 across two campuses. 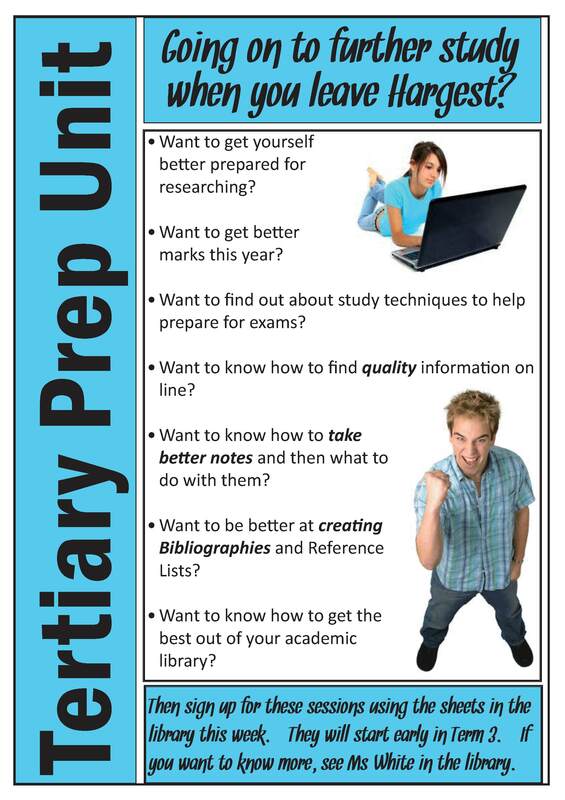 The Tertiary Prep Programme at James Hargest College grew out of the whole school Information Literacy Programme, was developed during the 2009 year and trialled in 2010 after being promoted to Year 13 students. Over 68% of students at James Hargest College go on to tertiary study so this programme was designed to support that transition. Tutorials were offered during study periods and Study Centre with specific sessions being advertised so students knew what was being covered in each session. Sessions were built around information literacy skills already taught between Year 9-12 and were refined and changed according to feedback from students and evaluation by the librarian. A website was created to support the students attending.